The latest twist in Uganda's hang the homos saga was played out last week when the High Court in Kampala ordering Rolling Stone newspaper to stop publishing the names, photographs and addresses of people it says are gay. Alongside the photos, the paper urged the government: Hang them. The court order came too late for the 26 already featured in two issues of the newspaper. Frank Mugisha, director of gay rights group Sexual Minorities Uganda, told me last week that almost everyone outed by the paper, including himself, had since been attacked or harassed and that some were in danger of losing their jobs. Giles Muhame, the defiant 22-year-old editor of Rolling Stone, now says he will find a way to dodge the law and work through a list he says he has of 100 gay men and women. Muhame's views will be abhorrent to many Western people but his views are not uncommon among many young Africans. In Uganda's bars and cafes, I found a lot of support for Muhame and his paper. A group of Ugandans identified as homosexual in a newspaper article headlined Hang Them have won damages and a court injunction ordering the paper not to repeat the exercise, human rights groups have said. 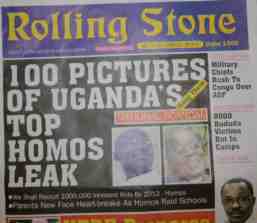 A high court judge ruled that the story in the Rolling Stone newspaper, which printed addresses and photographs of some of the 100 people it named as Uganda's top homos , violated their constitutional rights to privacy and safety. The court awarded the three plaintiffs in whose names the case was launched just over £400 each in damages, the Civil Society Coalition on Human Rights and Constitutional Law in Uganda said in a statement. The front page of Rolling Stone claimed that the country's homosexual community aimed to recruit 1,000,000 children by 2012 , and that parents face heart-breaks [sic] as homos raids schools . Inside, a headline read: Hang them; They are after our kids!! He was a brave and fiercely committed activist who led the Ugandan struggle for gay rights for more than a decade. David Kato went to jail for his beliefs, and to court, winning his greatest victory three weeks ago against a newspaper that had called for him to be hanged. But now he appeared to have paid the ultimate price: he had been battered to death with a hammer in his home in Kampala. As distraught family and friends gathered at the scene, police said they had arrested a man hired to drive for Kato and were pursuing another male suspect seen leaving the house. A police spokesman said the motive appeared to be robbery. But given the fierce anti-gay campaigns launched in recent years by some religious leaders and journalists, as well as politicians who drafted laws to have gay people locked up for life or even executed, there are inevitable questions as to whether Kato was killed because of his sexuality. A Ugandan man has been sentenced to 30 years in prison for the murder of gay rights activist David Kato. Sidney Nsubuga Enoch admitted to killing Kato with a hammer. But he was only convicted of second-degree murder, having claimed that he acted in self-defense. Enoch told the court Kato was making sexual advances, and that he had no choice but to kill him.